"Breaded buttermilk fried chicken and a pan-drippings gravy with milk or cream. The gravy is great on the chicken, but mash up some potatoes with some butter and cream and bake up some cornbread or biscuits and you have the quintessential southern meal with some northern urban twists." Whisk buttermilk, onion powder, parsley, tarragon, sage, paprika, and 1 teaspoon cayenne pepper in a bowl. Place chicken breast pieces in buttermilk mixture, stir to coat, and marinate in refrigerator at least 8 hours (up to 2 days). Drain chicken pieces in a colander. Mix 2 cups all-purpose flour, garlic salt, onion salt, 1 teaspoon cayenne pepper, salt, and black pepper in a heavy, resealable plastic bag. Whisk eggs with 2 tablespoons milk in a bowl; season with salt and black pepper. Heat grapeseed oil in a large, heavy skillet over medium-high heat until a pinch of flour dropped into the oil sizzles. Place 1/2 cup all-purpose flour into a shallow bowl. Press chicken pieces into unseasoned flour, dip into egg mixture, and place into plastic bag of seasoned flour. Close bag and shake to coat chicken. Fry coated chicken in hot oil until golden brown, 8 to 12 minutes on the first side and 6 to 8 minutes on the second side. Drain on a rack. Drain oil, leaving 1/4 cup oil in skillet. Reduce heat to medium. Whisk quick-mixing flour and milk into hot oil until combined. Bring gravy to a simmer and cook, whisking constantly, until thickened and creamy, about 5 minutes. Season with salt and white pepper. 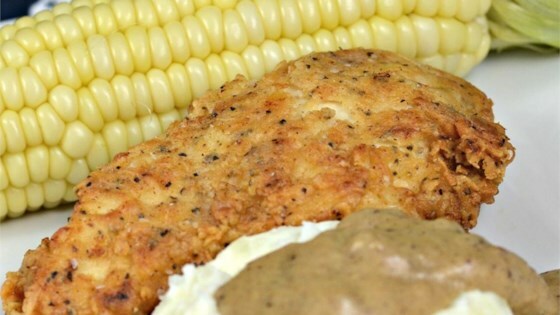 Serve gravy with fried chicken. Be careful to keep the oil hot enough to fry the chicken, but not so high as it burns the chicken. To do this on an electric stove one may have to alternate the settings several times while one is cooking. Also, it is a good idea to have a pan lid and a fire extinguisher handy whenever you fry in oil. I have not tried 2 cups unflavored yogurt in place of the buttermilk, but others have and say that it is not noticeably different in flavor. I often use ranges for ingredient amounts. I find that no two meals are alike, so a range often encourages one to be mindful of their ingredients and the sizes of pieces. Fry in grapeseed oil or other high smoke-point oil such as canola or peanut oil. The nutrition data for this recipe includes the full amount of the marinade and breading ingredients. The actual amount of the marinade and breading consumed will vary. We have determined the nutritional value of oil for frying based on a retention value of 10% after cooking. The exact amount will vary depending on cooking time and temperature, ingredient density, and the specific type of oil used. We enjoyed this recipe but the tarragon & sage were a little over stated for us. I would make this again but up the black pepper and cut back on the sage and tarragon. Absolutely Delicious!! My whole family loved it. I sliced the chicken breast in half horizontally and fried for minutes on each side.